Heat and humidity recovery air handling units. Maximum air flow up to 690 m³/h. Air handling units for efficient energy saving supply and exhaust ventilation in flats, houses, cottages and other premises. Heat and humidity recovery minimizes ventilation heat losses during cold season and reduces air conditioner load during hot season. Controllable air exchange for creating the best suitable indoor microclimate. Compatible with round Ø125, 160 or 200 mm air ducts. The casing is made of double-skinned polymer-coated steel panels, internally filled with 20, 25, 30, 40 mm (depending on the unit model) mineral wool layer for heat- and sound-insulation. The unit is equipped with a hinged service panel to enable convenient access for maintenance or repair operations. The spigots are located at the top of the unit and are equipped with rubber seals for airtight connection to the air ducts. The built-in F7 filter provides efficient supply air filtration. The G4 filter is used for extract air cleaning. The G3 filters are used for supply and exhaust air filtration in the KOMFORT EC S(B)200 units. Supply air in the KOMFORT EC S(B)250 units is purified by the G4 and F7 filters. The G4 filter is used for extract air cleaning. The units are equipped with high-efficient EC motors with an external rotor and a centrifugal impeller with backward curved blades. EC motors have the best power consumption to air capacity ratio and meet the latest demands concerning energy saving and high-efficient ventilation. EC motors are featured with high performance, low noise level and optimum control across the entire speed range. The impellers are dynamically balanced. 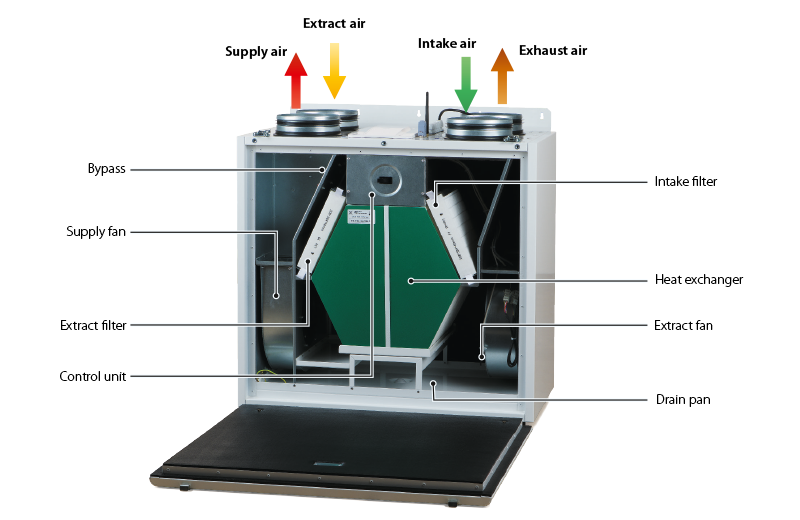 The KOMFORT EC SB(-E) units are equipped with a bypass for ventilation (air cooling by the cool air from outside). 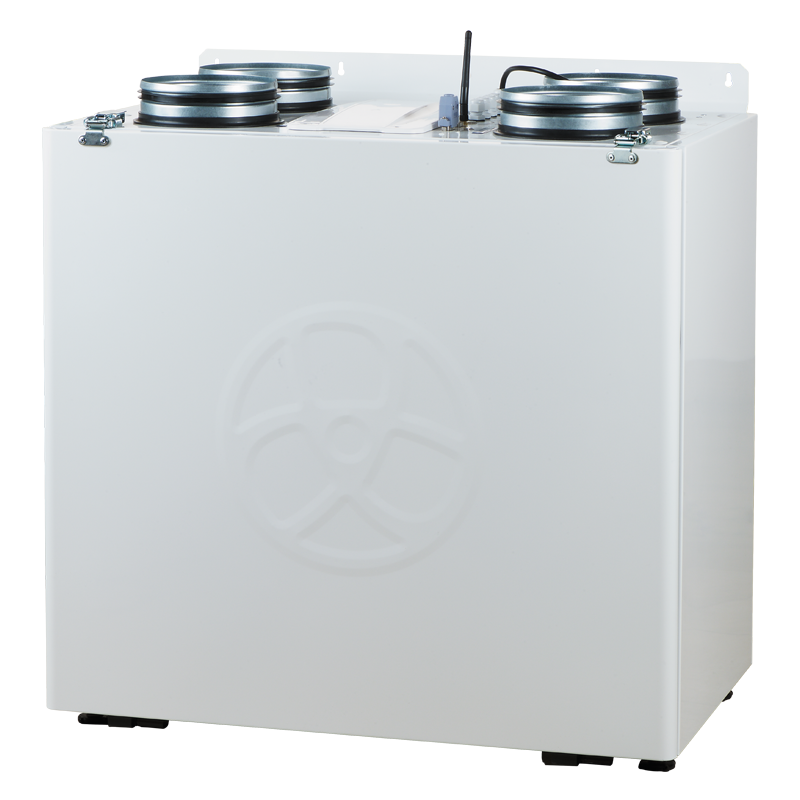 The KOMFORT EC S(B) unit is equipped with a plate counter-flow polystyrene heat exchanger for heat recovery. In the unit condensate is collected and drained to the drain pan under the heat exchanger. The KOMFORT EC S(B)-E unit is equipped with an enthalpy plate counter-flow heat exchanger for enegry (heat and humidity) recovery. Due to humidity recovery condensate is not generated in the enthalpy heat exchanger. The air flows are completely separated in the heat exchanger. Thus smells and contaminants are not transferred from the extract air to the supply air. Heat recovery is based on heat and/or humidity transfer through the heat exchanger plates. In the cold season supply air is heated in the heat exchanger by transferring the heat energy of warm and humid extract air to the cold fresh air. Heat recovery minimizes ventilation heat losses and heating costs respectively. In the warm season the heat exchanger performs reverse and intake air is cooled in the heat exchanger by the cool extract air. That reduces operation load on air conditioners and saves electricity. When the indoor and outdoor temperature difference is insignificant, heat recovery is not reasonable. In this case the heat exchanger can be temporary replaced with a summer block for the warm season (available as a specially ordered accessory). The units are designed for wall or floor mounting. Universal casing design provides either left-handed or right-handed unit installation. 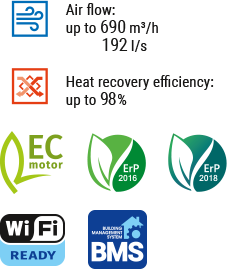 The KOMFORT EC S(B)(-E) S21 units are equipped with a build-in automation system. The remote control panel is not included in the delivery set (available separately). The unit can be controlled by the Blauberg AHU mobile application via Wi-Fi. The KOMFORT EC S(B)(-E) S14 units have an integrated automation system with a wall-mounted control panel S14 with a LED indication. The KOMFORT EC S(B)200 and KOMFORT EC S250 are available only with an S14 automation. option: function is available when purchasing the appropriate accessory (see the "Accessories" section).